Output Technology's new PrintStation 40T is suitable for all your front desk applications where the capacity to print on any cut sheet, with variable thickness and size, is combined with the ability to print on fanfold paper. These capabilities allow the PrintStation 40T to meet the demanding requirements of users in those transaction based applications which require printing of multiple types of document sets, along with fanfold forms, where printer size is crucial and operator comfort is key. All applications where interaction between the customer and the operator involves the creation of a printed document. The PrintStation 40T printer offers a 30-Day Customer Satisfaction Guarantee! 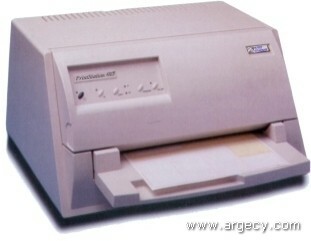 The PrintStation 40T is a very compact and robust printer that provides you with excellent application flexibility.